Nice of you to check in. 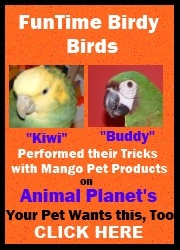 Peppy is a pretty cautious bird and I have trouble getting him use to new things. He's my first bird so maybe I just don't know how to handle birds yet. I did manage to get him out of his cage and onto the gym twice. I was surprised that he liked the toys so much, I guess it was a nice change from the ones in his cage. When he gets a little more relaxed outside his cage and I can get some pictures of him I'll be sure to send you one. I am pleased with the gym and the speed with which it arrived. Great Service! I wanted to send you an update, Peppy is getting more comfortable outside his cage and is enjoying his playgym. I surfed the interenet looking for something I thought he might enjoy. I'm so glad I came across your website. Your price and customer service are great. I've attached a few pics of Peppy enjoying his playgym.